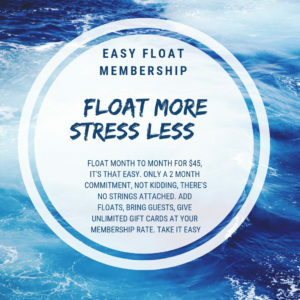 When the body is floating you are relieved of gravity in the weightless environment of a float tank, then blood flow is increased and can more easily facilitate the recovery of strained muscle tissue and effectively relieve chronic pain. When the body isn’t tasked with having to function on all levels to perform in the real world of work, school, and all other responsibilities, then it is able to concentrate energy on healing. This particular benefit could also be listed in the mental benefit section too. Many high performance athletes are utilizing floating to recover between work outs and games to allow their bodies to rest and effectively recover. By totally reducing the feeling of gravity on muscles, internal organs, and the musculoskeletal system, your body can be relieved of chronic pain by simply being suspended in weightlessness. You will often hear the sound of your joints and muscles relaxing. During your float your brain will begin to create theta waves and suspend alpha waves. We experience theta state every night before falling completely asleep, but only briefly. While floating, theta waves exist in the brain for an extended time providing you with the best rest you’ll ever experience. After your float your skin feels smooth and replenished thanks to the magnesium based Epsom salt. In our current culture we are often overwhelmed by constant stimuli. Simply by putting all of the phones and tablets out of reach for 90 minutes you are able to unplug to recharge. Floatation provides a calming and peaceful state of mind that can free you from stress. Many nonfigurative mental issues, such as depression or PTSD, are often treated with meds that essentially shift the brain’s chemistry, but the use of floatation has also provided results for alleviating these conditions by naturally employing brain chemistry. Just like in fatigue reduction, those wonderful theta waves are more apt to return and last as you fall asleep at night after floating, and the next night after that. During and probably even more afterwards, you enjoy overwhelming feelings of positivity. It’s amazing what a break from the world can do for your mood.